Call them Beverage Vendors, Soda, Pop, or Drink Machines, these machines dispense cold drinks in a variety of packaging configurations. Originally manufactured by Royal, Vendo, Dixie Narco, and AMS, our used beverage vendors go through the A&M “Like New” refurbishment process. (click here for a complete description of the process). The A&M refurbished beverage machines are even used by the bottlers of Coke, Pepsi and Dr. Pepper. With placement flexibility in mind, A&M drink vending machines come with different foot prints and capacities. From 196 bottles to 648 cans and all combinations in between, A&M’s beverage vendors can be customized to sell a mix of cans and bottles from one soda machine. Our refurbished drink vending machines comes with a 90 days warranty period, and our customer support is readily available to help with any technical questions that may arise. A&M used vending machines aren’t like the other used vending machines that you come across in markets. 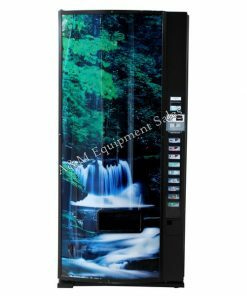 A&M used vending machines are restored, refurbished and redesigned with great care to make sure you have a great experience using our products. Our intent behind supplying refurbished vending machines is to give our customers the same experience of a new machine, but within their budgets. The A&M refurbished vending machines look as well as work as good as those brand new vending machines available for high prices in the market. Click here for more information.